Brook sides and blossoms always seem to go together. 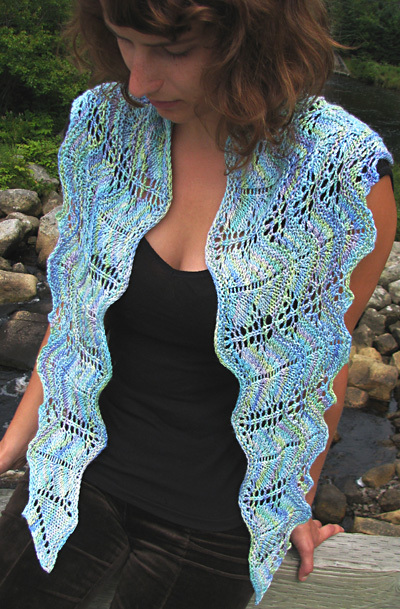 With this design, I wanted to combine the flowing motion of a rivulet with a lacy floral stitch pattern. The pale blues of the lustrous handpainted yarn play with the watery theme while spots of yellow, pink, and lavender evoke the colours of wildflowers found along the edges of a stream. This delicate shawlette is worked from the bottom up by building one row of motifs upon the next while increasing the columns of motifs along the sides. The rapid side increases result in a shawl with long tapered ends. These can be draped over the shoulders or even wrapped around to the back and tied to form a shrug. To create a larger shawl, simply continue to increase along the sides as established until you have the depth you would like. 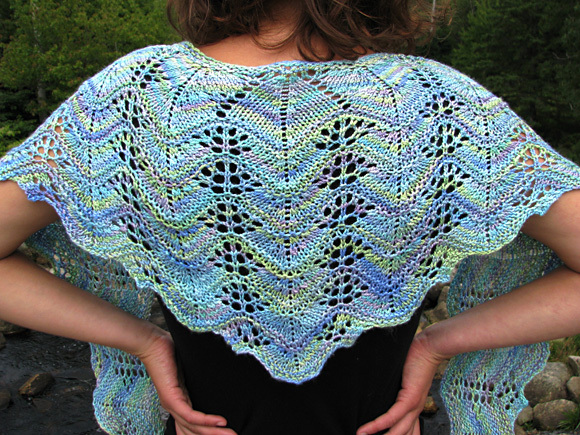 Decreases at the center in the last repeat help keep the shawlette in place on the shoulders. Sl 1 wyif: Slip 1 stitch purlwise with yarn in front. The charts for this pattern are very large and fit on a letter-sized page. Click here and print the resulting page. Work from Charts [above] or Written instructions [below], as you prefer. Row 1 [RS]: Sl 1 wyif, k2, sl m, yo, k to last 3 sts, yo, sl m, k3. Row 2 [WS]: Sl 1 wyif, k to end of row. Row 3 [RS]: Sl 1 wyif , k2, sl m, yo, k1, yo, k6, ssk, k2tog, k6, yo, k1, yo, sl m, k3. Row 4 [WS]: Sl 1 wyif, k2, p to last 3 sts, k3. Row 5 [RS]: Sl 1 wyif, k2, sl m, yo, k2, yo, k1, yo, k3, ssk twice, k2tog twice, k3, yo, k1, yo, k2, yo, sl m, k3. Row 6 [WS]: Sl 1 wyif, k2, p to last 3 sts, remove marker, k3; using backwards loop method, CO 14 sts. Row 7 [RS]: K3, replace marker, k16, *(k1, yo) 3 times, ssk 3 times, k2tog 3 times, (yo, k1) twice, yo; repeat from * to last 6 sts, k3, remove marker, k3; using backwards loop method, CO 14 sts. Row 8 [WS]: K3, replace marker, k to end of row. Row 9 [RS]: Same as Row 1. Row 10 [WS]: Same as Row 2. Row 11 [RS]: Sl 1 wyif, k2, sl m, yo, *k1, yo, k6, ssk, k2tog, k6, yo; repeat from * to last 4 sts, k1, yo, sl m, k3. Row 12 [WS]: Same as Row 4. Row 13 [RS]: Sl 1 wyif, k2, sl m, yo, k1, *(k1, yo) twice, k3, ssk twice, k2tog twice, k3, yo, k1, yo; repeat from * to last 5 sts, k2, yo, sl m, k3. Row 14 [WS]: Same as Row 6, including CO of additional 14 sts. Row 1 [RS]: Sl 1 wyif, k2, sl m, yo, [k1, yo, k6, ssk, k2tog, k6, yo] 6 times, pm for Central Panel, k7, ssk, k2tog, k7, pm, [yo, k6, ssk, k2tog, k6, yo, k1] 6 times, yo, sl m, k3. Row 2 [WS]: Sl 1 wyif, k2, p to last 3 sts, k3. Row 3 [RS]: Sl 1 wyif, k2, sl m, yo, k1, [k1, yo, k6, ssk, k2tog, k6, yo] 6 times, sl m, k6, ssk, k2tog, k6, sl m, [yo, k6, ssk, k2tog, k6, yo, k1] 6 times, k1, yo, sl m, k3. Rows 4, 6, 8, 10, 12, and 14 [WS]: Same as Row 2. Row 5 [RS]: Sl 1 wyif, k2, sl m, yo, k2, [(k1, yo) twice, k3, ssk twice, k2tog twice, k3, yo, k1, yo] 6 times, sl m, k5, ssk, k2tog, k5, sl m, [yo, k1, yo, k3, ssk twice, k2tog twice, k3, (yo, k1) twice] 6 times, k2, yo, sl m, k3. Row 7: Sl 1 st pwise wyif, k2, sl m, yo, k3, [(k1, yo) 3 times, ssk 3 times, k2tog 3 times, (yo, k1) twice, yo] 6 times, sl m, k4, ssk, k2tog, k4, sl m, [(yo, k1) twice, yo, ssk 3 times, k2tog 3 times, (yo, k1) 3 times)] 6 times, k3, yo, sl m, k3. Row 9 [RS]: Sl 1 wyif, k2, sl m, yo, k4, [k1, yo, k6, ssk, k2tog, k6, yo] 6 times, sl m, k3, ssk, k2tog, k3, sl m, [yo, k6, ssk, k2tog, k6, yo, k1] 6 times, k4, yo, sl m, k3. Row 11 [RS]: Sl 1 wyif, k2, sl m, yo, k5, [k1, yo, k6, ssk, k2tog, k6, yo] 6 times, sl m, k2, ssk, k2tog, k2, sl m, [yo, k6, ssk, k2tog, k6, yo, k1] 6 times, k5, yo, sl m, k3. Row 13 [RS]: Sl 1 wyif, k2, sl m, yo, k6, [(k1, yo) twice, k3, ssk twice, k2tog twice, k3, yo, k1, yo] 6 times, sl m, k1, ssk, k2tog, k1, sl m, [yo, k1, yo, k3, ssk twice, k2tog twice, k3, (yo, k1) twice] 6 times, k6, yo, sl m, k3. Row 15 [RS]:Sl 1 st pwise wyif, k2, sl m, yo, k7, [(k1, yo) 3 times, ssk 3 times, k2tog 3 times, (yo, k1) twice, yo] 6 times, sl m, ssk, k2tog, sl m, [(yo, k1) twice, yo, ssk 3 times, k2tog 3 times, (yo, k1) 3 times)] 6 times, k7, yo, sl m, k3. Row 16 [WS]: Sl 1 wyif, k to end of row. Using the Long-Tail Cast-On method, CO 22 sts. Foundation Row [WS]: K3, pm, k to last 3 sts, pm, k3. Begin to work according to Chart A. Work Rows 1-14 of Chart A once. Work Rows 7-10 of Chart A once more. 228 sts. Final 2 Rows: Sl 1 wyif, k to end of row. BO very loosely knitwise, using the larger needle to work the stitches. Leave yarn tails at least 3 inches long. These will be trimmed flush to the fabric when blocking is complete. I recommend a wet block for this pattern. Gently wash your finished shawlette with a mild detergent in cool water and rinse thoroughly with cool water. Remove the excess water by rolling the shawlette in a towel and gently squeezing the roll. Unroll the towel and spread the damp shawlette out onto a flat surface. The surface will have to be one into which you will be able to place pins, such as a carpet or some other padded surface. Secure with blocking pins. Along each side, pull out the scalloped points that are formed by the stitch pattern and pin into place. Along the long, top edge, pin it in such a way as to emphasize the wavy border. Allow to rest undisturbed until thoroughly dry, usually for at least 24 hours. 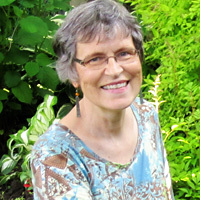 Based in Nova Scotia, Canada, Ilga Leja has been designing classical, elegant knitwear with a contemporary look since 2005. Her designs are often inspired by the natural world around her and she is at her happiest when exploring the banks of brooks and rivers. You can see more of her designs on her website.